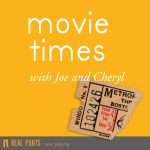 Joe and Cheryl watched Captain America: Civil War and discuss that horrorshow of a summer blockbuster, then talk about Maggie Nelson’s The Argonauts, without any attempts to tie the two together (thankfully). They’re trying a new thing where they talk about another piece of culture in addition to reviewing a movie. Warning: wine-induced unwieldiness ahead.